You are here : Home > Wheels > Maruti Cervo: Small Car, Big Hit??? Maruti Cervo is an upcoming hatchback from Maruti Suzuki India Limited. Maruti Cervo is designed for small family purpose and to enjoy the city drive comfortably. Maruti Cervo is getting ready to hit Indian roads by first quarter of 2012. Maruti Cervo is an upcoming hatchback from Maruti Suzuki India Limited. 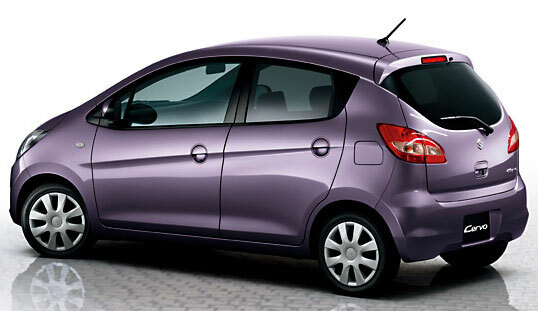 Maruti Cervo is designed for the small family purpose and to enjoy the city drive comfortably. Maruti Cervo is getting ready to hit Indian roads by first quarter of 2012. This car is already running successfully in Japan and the company is planning to repeat the same story in India. According to the predictions and speculation of auto experts, Maruti Cervo will be the fastest and most selling car in the Indian auto market, after its launch. Maruti, the leader of small car market faced the toughest competition when Tata launched their small car Nano. To reply technology with performance, Maruti announced launching their stylish car Cervo. But the competition became even more tougher when Hyundai launched Eon which heavily affected the sales of Maruti Alto. Maruti is waiting for the right time to launch Cervo to repeat success in India and to regain the lost power. Comparing with Hyundai Eon and Tata Nano, Maruti Cervo is even more attractive and will be priced in the range of Rs 2 to 3.5 lacs. Ex-showroom price of TATA Nano is around 1.3 Lacs and Hyundai Eon is around 2.75 to 3.75 lacs. The basic variants will be supplied with classy features. Very soon, Maruti Cervo is expected to bring tough competition with Hyundai’s Eon. The number of variants of India bound Maruti Cervo is not confirmed so far. The Maruti Cervo On Road Price will be inclusive of the Vehicle price, Road tax, Insurance and registration fees can further increase the cost up to 10% extra. It is around 2.25 to 3.85 lacs. Maruti Cervo Mileage: The Maruti Cervo India delivers a top Speed of 115 km/h with an average Mileage – 18 to 21 kmpl. In city the car gives a mileage – 20kmpl. On the highway the car gives a mileage of 22 kmpl. The Maruti Cervos interior looks like new Maruti Swift. Maruti Cervo has comfortable front semi-bucket seats, sporty headlamps and fog lamps and Bluetooth capability. The exterior look of Maruti Cervo is very compact and little sporty. Small front grill and sharp curves over bonnet reflect the aggressive look. It has great quality interiors and expecting to be solid build as well. The engine of Maruti Cervo offers peppy performance with great fuel efficiency. The wide dashboard of Maruti Cervo has eye-catching style and is smartly designed. When it to head and leg room, it gives sufficient space for all the occupants. It will have common interior features like AC, audio system, power steering, seats belts, central lock etc. Apart from the exteriors of the Maruti Cervo the interiors of the car is also attractive and spacious. The drive wheel is a three spoke power steering type for easy and comfy handling in the city streets. The steering wheel is adjustable as well. Maruti Cervo will surely attract the younger generation with its nice features included sporty stylish look, elegant interiors and sleek external design. Maruti Cervo will definitely create a good impression in the Indian automobile market. We can say that, Maruti Cervo will be one of the fastest and most selling cars in the Indian auto market, after its launch. From performance to price Maruti Cervo is going to be a tough competitor for Hyundai Eon. Maruti Cervo has great fuel efficiency than Hyundai Eon. Maruti Cervo gives a mileage of 21-22 kmpl whereas Hyundai Eon gives mileage of 18-19kmpl. Stylish exterior and interior features offers Maruti Cervo a bonus. When Hyundai eon offers only standard features in basic variant, Maruti cervo offers power steering, 3 inches tyres, cup holders and classy features in the basic variant itself. Cervo also has a solid suspension which makes it well fit to drive on Indian roads. The Ex-showroom price of Hyundai Eon is around 2.75 to 3.75 lacs where as Maruti Cervo comes with a price range of 2.00 to 3.50 lacs which also is an added benefit. On road car price is also much lesser than Eon. Over all, Maruti Cervo is expecting to be a bigger hit than Hyundai Eon. 2 Response to "Maruti Cervo: Small Car, Big Hit???"